A kangaroo is any of several large marsupial mammals of the Macropodidae family, which includes wallabies, tree-kangaroos, wallaroos, pademelons, and quokkas, with at least 69 species in total. Kangaroos are best known for their great leaping power due to the structure of their hind legs. They are native to Australia, New Guinea, and neighboring islands. While the term kangaroo is used in the broad sense of referring to all members of the macropod family, it is often reserved for the four largest macropods, namely the Red Kangaroo, the Antilopine Kangaroo, the Eastern Grey Kangaroo, and the Western Grey Kangaroo of the Macropus genus. Smaller macropod species generally are referred to as wallabies rather than kangaroos, while some intermediate in size are called wallaroos. These unique creatures—which may start out only 1 cm long, crawl by their forearms to their mothers' pouches, and then grown to two-legged, hoping adults larger than a human—are considered both a pest and a resource. As kangaroo populations have grown in number as humans modified the landscape for grazing cattle and sheep, kangaroos have reached the level that farmers consider them pests. As resources, kangaroos provide not only meat and skin, and a source of medical and scientific insights, but also an aesthetic joy to humans. The kangaroo is an Australian icon: it is featured on the Australian Coat of Arms and on some currency, and is used by many Australian organizations, such as Qantas. The Red Kangaroo (Macropus rufus) is the largest surviving marsupial anywhere in the world. Fewer in numbers, the Red Kangaroos occupy the arid and semi-arid center of the continent. A large male can be two meters (six feet, seven inches) tall and weigh 90 kg (200 lb). The Eastern Grey Kangaroo (Macropus giganteus) is less well known than the red (outside of Australia), but the most often seen, as its range covers the fertile eastern part of the continent. A Tasmanian Forester (Eastern Grey) Kangaroo in motion. In addition, there are over 60 smaller macropods closely related to these kangaroos in the family Macropodidae. The word kangaroo derives from the word gangurru, referring to a gray kangaroo, of the Guugu Yimidhirr, an Australian Aboriginal language. The name was first recorded as "Kangooroo" or "Kanguru" on August 4, 1770, by Lieutenant (later Captain) James Cook on the banks of the Endeavor River at the site of modern Cooktown, when HM Bark Endeavor was beached for almost seven weeks to repair damage sustained on the Great Barrier Reef. Kangaroo soon became adopted into standard English where it has come to mean any member of the family Macropodidae. Male kangaroos are called bucks, boomers, jacks, or old men; females are does, flyers, or jills, and the young ones are joeys. The collective noun for kangaroos is a mob, troop, or court. Kangaroos are sometimes colloquially referred to as roos. Kangaroos have long been regarded as strange animals. Early explorers described them as creatures that had heads like deer (without antlers), that stood upright like people, and that hopped like frogs. Combined with the two-headed appearance of a mother kangaroo, this led many back home to dismiss them as travelers' tales for quite some time. Kangaroos have large, powerful hind legs, large feet adapted for leaping, a long muscular tail for balance, and a small head. Like all marsupials, kangaroos have a pouch called a marsupium in which joeys complete postnatal development. The average life expectancy of a kangaroo is about four to six years, with some living until they are about 23. As with all marsupials, kangaroo young are born at a very early stage of development—after a gestation of 31–36 days. At this stage, only the forelimbs are somewhat developed to allow the newborn to climb to the pouch and attach to a teat. In comparison, a human embryo at a similar stage of development would be about seven weeks old, and premature babies born at less than 23 weeks are usually not mature enough to survive. 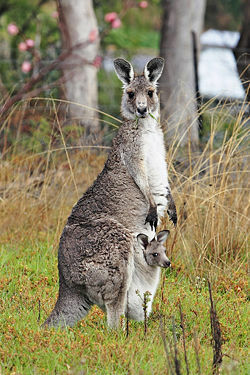 The joey will usually stay in the pouch for about nine months (180–320 days for the Western Grey) before starting to leave the pouch for small periods of time. It is usually fed by its mother until reaching 18 months. The female kangaroo is usually pregnant in permanence, except on the day she gives birth; however, she has the ability to freeze the development of an embryo until the previous joey is able to leave the pouch. This is known as diapause, and will occur in times of drought and in areas with poor food sources. The composition of the milk produced by the mother varies according to the needs of the joey. In addition, the mother is able to produce two different kinds of milk simultaneously, for the newborn and the older joey still in the pouch. During a dry period, males will not produce sperm, and females will only conceive if there has been enough rain to produce a large quantity of green vegetation. Kangaroos and wallabies have large, elastic tendons in their hind legs. They store elastic strain energy in the tendons of their large hind legs, providing most of the energy required for each hop by the spring action of the tendons, rather than by any muscular effort. This is true in all animal species—which have muscles connected to their skeleton through elastic elements such as tendons—but the effect is more pronounced in kangaroos. There is also a link between the hopping action and breathing: as the feet leave the ground, air is expelled from the lungs; bringing the feet forward ready for landing refills the lungs, providing further energy efficiency. 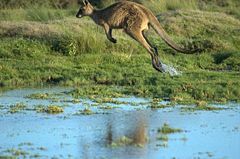 Studies of kangaroos and wallabies have demonstrated that, beyond the minimum energy expenditure required to hop at all, increased speed requires very little extra effort (much less than the same speed increase in, say, a horse, dog, or human). 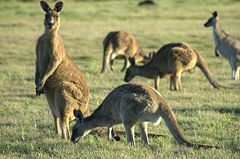 For kangaroos, the key benefit of hopping is not speed to escape predators—the top speed of a kangaroo is no higher than that of a similarly-sized quadruped, and the Australian native predators are in any case less fearsome than those of other continents. Rather, the key benefit is economy: in an infertile continent with highly variable weather patterns, the ability of a kangaroo to travel long distances at moderately high speed in search of food sources is crucial to survival. A sequencing project of the Kangaroo genome was started in 2004 as a collaboration between Australia (mainly funded by the state of Victoria) and the National Institutes of Health in the US. The genome of a marsupial such as the kangaroo is of great interest to scientists studying comparative genomics because marsupials are at an ideal degree of evolutionary divergence from humans: mice are too close and have not developed many different functions, while birds are genetically too remote. Kangaroos are herbivores, feeding on grass and roots, and they chew cud. Many species are nocturnal (active at night) and crepuscular (active during the twilight), usually spending the days idling quietly and the cool evenings, nights, and mornings moving about and feeding, typically in packs. Kangaroos have few natural predators. The Thylacine, considered by palaeontologists to have once been a major natural predator of the kangaroo, is now extinct. However, with the arrival of humans in Australia at least 50,000 years ago, and the introduction of the dingo (a type of wild dog in Australia) about 5,000 years ago, kangaroos have had to adapt. Wedge-tailed Eagles and other raptors usually eat kangaroo carrion. Goannas and some other carnivorous reptiles also pose a danger to smaller kangaroo species when other food sources are lacking. Along with dingoes and other canids, introduced species like foxes and feral cats also pose a threat to kangaroo populations. Kangaroos and wallabies are adept swimmers, and often flee into waterways if presented with the option. If pursued into the water, a large kangaroo may use its forepaws to hold the predator underwater so as to drown it. Another defensive tactic described by witnesses is catching the predator with the forepaws and disembowelling it with the hind legs. A mob of Forester (Eastern Grey) Kangaroos grazing. A mob may have ten or more males and females. There is a dominant male (called a boomer) in the mob, whose identity is decided based on the relative sizes and ages of males in the mob (the largest and strongest becomes the boomer). A boomer has temporary exclusive access to females in a mob for mating. A boomer may find himself wandering in and out of a mob—surveying the females and intimidating rival males. Courtship behavior in most species involves the male act of "checking" the female's cloaca (urinary chamber). The males are often rejected by the females if they are small relative to the other males. Often, when the female is being checked, it urinates. 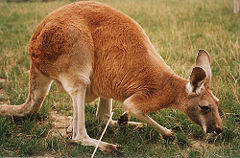 The male kangaroo will sniff the urine multiple times until it is satisfied, then proceed to pursue the mating cycle. Studies of kangaroo reproduction conclude that this ritual is typical so that a male kangaroo may check whether the female kangaroo is receptive to him. The sexually aroused male follows the responsive female. The arched tail is indicative that either one or both kangaroos are ready to mate. Tail scratching, a form of foreplay, can occur between partners. The male kangaroo may sometimes be found giving the female kangaroo a back rub before mating. Before European settlement, the kangaroo was very important to Australian Aborigines for its meat, hide, bones, and sinews. In addition, there were important dreaming stories (Australian Aboriginal myths) and ceremonies involving the kangaroo. Aherrenge is a current kangaroo dreaming site in the Northern Territory. The game of Marn Grook was played by the Kurnai people using a ball made from a kangaroo scrotum. Unlike many of the smaller macropods, kangaroos have fared well since European settlement. European settlers cut down forests to create vast grasslands for sheep and cattle grazing, added stock watering points in arid areas, and have substantially reduced the number of dingoes, all of which were beneficial changes for kangaroos. Kangaroos are shy and retiring by nature and in normal circumstances present no threat to humans. Male kangaroos often "box" amongst each other, either playfully, for dominance, or in competition for mates. The dexterity of their forepaws is utilized in both punching and grappling with the foe, but the real danger lies in a serious kick with the hind leg. The sharpened toenails can disembowel an opponent. There are very few records of kangaroos attacking humans without provocation. However, several such unprovoked attacks in 2004 spurred fears of a rabies-like disease possibly affecting the marsupials. The only reliably documented case of a fatality from a kangaroo attack occurred in New South Wales in 1936. A hunter was killed when he tried to rescue his two dogs from a heated fray. Other suggested causes for erratic and dangerous kangaroo behavior include extreme thirst and hunger. In 2004, an Eastern Grey, saved a farmer's life. Name Lulu, she received the RSPCA National Animal Valor Award on May 19 of that year. 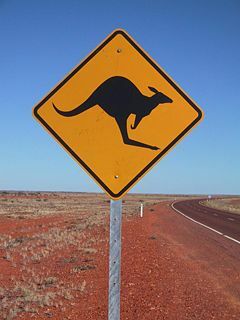 A "kangaroo crossing" sign on an Australian highway. A collision with a vehicle is capable of killing a kangaroo. Kangaroos blinded by headlights or startled by engine noise have been known to leap in front of cars. Since kangaroos in mid bound can reach speeds of around 50 km/h (31 mph) and are relatively heavy, the force of impact can be severe. Small vehicles may be destroyed, while larger vehicles may suffer engine damage. The risk of harm to vehicle occupants is greatly increased if the windscreen is the point of impact. As a result, "kangaroo crossing" signs are commonplace in Australia. Vehicles that frequent isolated roads where roadside assistance may be scarce are often fitted with "roo bars" to minimize damage caused by collision. Mounted devices, designed to scare wildlife off the road with ultrasound and other methods, have been devised and marketed. If a female is the victim of a collision, animal welfare groups ask that her pouch be checked for any surviving joey, in which case it may be removed to a wildlife sanctuary or veterinary surgeon for rehabilitation. Likewise, when an adult kangaroo is injured in a collision, a vet, the RSPCA, or the National Parks and Wildlife Service can be consulted for instructions on proper care. In New South Wales, rehabilitation of kangaroos is carried out by volunteers from NSW Wildlife Information and Rescue Service (WIRES). Occasionally, individuals take on the task of rearing a recovered joey themselves. The rule of thumb is that if the joey is already covered with fur at the time of the accident (as opposed to still being in its embryonic stage), it stands a good chance of growing up properly. Lactose-free milk is required to prevent the animal from developing blindness. They hop readily into a cloth bag when it is lowered in front of them approximately to the height where the mother's pouch would be. The joey's instinct is to "cuddle up," thereby endearing themselves to their keepers. But after hand-rearing a joey, it cannot usually be released into the wild and expected to provide for itself immediately. Usually wildlife sanctuaries are willing to adopt kangaroos that are no longer practical to raise and have grown too large to contain. ↑ C. Groves, "Order Primates," "Order Monotremata," (and select other orders). Page(s) 64 & 66 in D. E. Wilson and D. M. Reeder, eds., Mammal Species of the World, 3rd edition, Johns Hopkins University Press (2005). ISBN 0801882214. ↑ Australian Government. 2007. Kangaroo Biology. Department of the Environment and Heritage. Retrieved January 12, 2007. ↑ Australian Government, Department of Foreign Affairs and Trade. 2007. Australia's Coat of Arms. Australia Now. Retrieved January 6, 2007. ↑ Australian Government, Department of Foreign Affairs and Trade. 2007. The Australian Currency. Australia Now. Retrieved January 6, 2007. ↑ Qantas Airways Limited. 2007 The Kangaroo Symbol. Qantas. Retrieved January 6, 2007. ↑ Red Kangaroos. 2007. Red Kangaroos. Red Kangaroos. Retrieved January 7, 2007. ↑ Wroe, Stephen. 2003. The Killer Rat-Kangaroo's Tooth. Nature Australia Volume 27, no 1:28 - 31. Retrieved January 6, 2007. ↑ IberiaNature. 2007. Etymology of mammal names. IberiaNature. Retrieved January 7, 2007. ↑ Project Gutenberg. 2007. Kangaroo - Captain Cook's Journal. Project Gutenberg. Retrieved December 31, 2006. ↑ BMW World. 2005. Driving the Australian Outback. BMW World. Retrieved December 31, 2006. ↑ San Diego Zoo. 2007. Animal Bytes: Kangaroo and Wallaby. Zoological Society of San Diego. Retrieved January 7, 2007. ↑ Oxford Dictionaries. 2007. Roo. Askoxford.com. Retrieved December 31, 2006. ↑ Infoplease.com. 2005. Gestation, Incubation, and Longevity of Selected Animals. Infoplease. Retrieved December 31, 2006. ↑ Burnie, David and Don E. Wilson (2001). Animal. New York, New York: DK Publishing, Inc., 99-101. ISBN 0789477645. ↑ NIH News. June 8, 2004. Kangaroo Hops in Line for Genome Sequencing. NIH (National Institutes of Health). Retrieved January 6, 2007. ↑ Canadian Museum of Nature. 2007. Canadian Museum of Nature - Kangaroo. Canadian Museum of Nature. Retrieved January 6, 2007. ↑ Aherrenge Association Inc, Aherrenge Association Inc. Retrieved April 1, 2008. ↑ The Scotsman. 2007. Blind kangaroo jumps in to rescue farmer| The Scotsman. Retrieved December 31, 2006. ↑ Morse, Sherry. 2007. Half-Blind Kangaroo Saves Life Of Unconscious Man. Buzzle.com. Retrieved December 31, 2006. ↑ LuLu the Kangaroo. 2004. "Lulu the Kangaroo" receives the RSPCA "National Animal Valor Award". luluthekangaroo.com.au. Retrieved December 31, 2006. Dawson, T. J. 1995. Kangaroos: Biology of the Largest Marsupials. Ithica, NY: Cornell University Press. Second printing: 1998. ISBN 0801482623. This page was last modified on 7 November 2011, at 15:27.